Doctor Who: Revisiting THE PARTING OF THE WAYS | Warped Factor - Words in the Key of Geek. The culmination of the Bad Wolf arc would see quite the ending coming to pass- as the Ninth Doctor regenerated into his Tenth incarnation at the conclusion of The Parting Of The Ways. 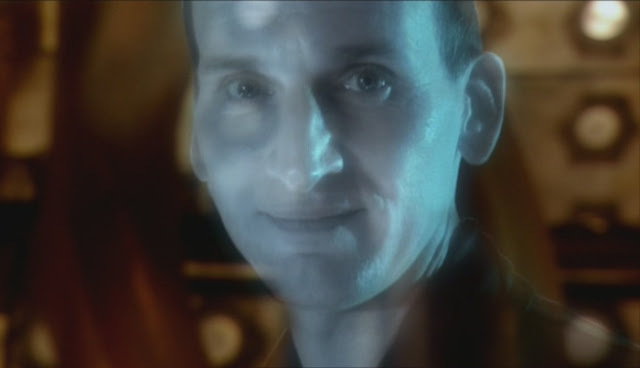 It was possibly the worst-kept secret of Doctor Who's revival, the fanfare at the casting of Christopher Eccleston matched by widespread surprise at his swift departure. Before he could consign the leather jacket to the annals of history, though, he had to cleanse himself of his survivors' guilt- a hangover from the Time War, or at least what he remembered of it. For his memory was actually retrospectively somewhat hazy owing to a little time-line technicality. He, alongside his past selves, had assisted the man he had been & two he would subsequently become in saving Gallifrey from destruction - with the immediate aftermath seeing the War Doctor become the Ninth having finally deemed himself worthy of the title again. "I've had many faces, many lives. I don't admit to all of them. There's one life I've tried very hard to forget. He was the Doctor who fought in the Time War, and that was the day he did it. The day I did it. The day he killed them all. The last day of the Time War. The war to end all wars between my people and the Daleks. And in that battle there was a man with more blood on his hands than any other, a man who would commit a crime that would silence the universe. And that man was me." So in a sense his regeneration into the big-eared one served as the chance to cast off the shackles of possibly his most difficult life yet. He had taken that in his stride, as well you might! "Oh yes, of course. I suppose it makes sense. Wearing a bit thin. I hope the ears are a bit less conspicuous this time." Regeneration is of course a lottery, though. Remember his first words upon both seeing his new body & meeting a certain former Henrik's employee who would become his companion? "Ah, could've been worse. Look at the ears." Ears which had of course pricked up the moment he heard the wartime opponents of the Time Lords had her in their clutches. "Because this is what I'm going to do. I'm going to rescue her. 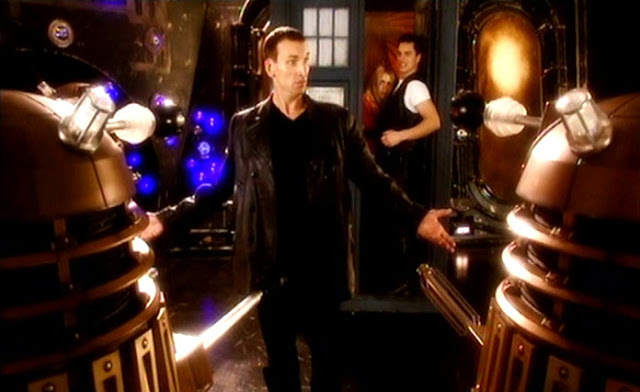 I'm going to save Rose Tyler from the middle of the Dalek fleet- And then I'm going to save the Earth, and then, just to finish off, I'm going to wipe every last stinking Dalek out of the sky!" DOCTOR: You looked into the Time Vortex. Rose, no one's meant to see that. EMPEROR : This is the Abomination! DOCTOR: Rose, you've got to stop this. You've got to stop this now. You've got the entire vortex running through your head. You're going to burn. EMPEROR: You cannot hurt me. I am immortal..
ROSE: You are tiny. I can see the whole of time and space. Every single atom of your existence, and I divide them. Everything must come to dust. All things. Everything dies. The Time War ends. And so comes the kiss of death, Rose's mind saved from implosion with the Time Lord absorbing energy from the Vortex he's guided the TARDIS through on so many occasions. She, though, remembers nothing of the event afterwards. 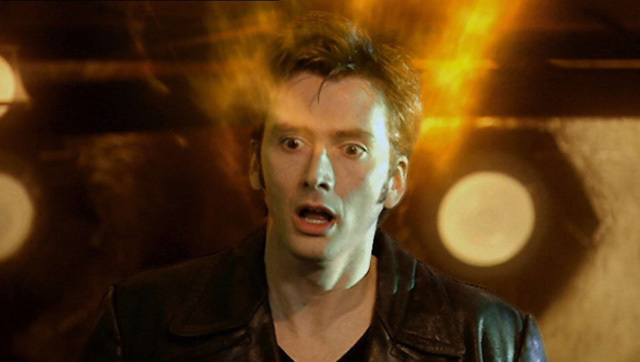 Perhaps the biggest shock for viewers who'd only watched since Russell T Davies won his battle to bring Doctor Who back was the fact that Eccleston could seemingly be shrugged off so easily, David Tennant springing up in the aftermath of the first regenerative process of the new era, golden light emanating from the man who had gone before to give a messianic touch to his cathartic reincarnation. With his old body & personality gone, could he finally cast off the rigours of war? "Hello. Okay. Ooo, new teeth. That's weird. So, where was I? Oh, that's right. Barcelona." First, he had an audience to win over! But had parting really been such sweet sorrow? No chance of the TARDIS being allowed to become ''a strange little thing standing on a street corner.''. Slimmer odds still on the likelihood that ''over the years, the world'll move on and the box will be buried ''. Not now that a new man had taken command of the central console! "Putting on a bit of speed! That's it!My beautiful ship! Come on, faster! That's a girl! Faster! Wanna to break the time limit?! Ah, don't be so dull... let's have a bit of fun! Let's rip through that vortex!"